This place is an absolute favorite of mine. Sake Bar Hagi has got a lot of the traditional Japanese street food on their menu such as yakitori and tako yaki and they have an extensive selection of cheap sake too. Their food is reasonably priced for a place that is located in the theater district. Although it's in a touristy area, there's nothing touristy about it. You won't find many tourists eating here as you would at the Olive Garden or Hard Rock Cafe in Times Square. They're actually a little tricky to find. It's in an underground location with a tiny little sign outside which makes the whereabouts of this place seemingly more lucrative to whoever finds it. Sake Bar Hagi has been featured on Anthony Bourdain's show a few years back and this is the place where Japanese chefs go to eat on their day off. Before they got all the attention and spotlight on the show, this place was primarily known by the Japanese or by word of mouth. Now with the sudden surge in popularity, it usually takes about an hour or two to get a table. And as you would normally find in any restaurant, the more popular they get, the crappier their service is. They're slow, they take forever to bring you water, but when the food comes, you'll be willing to overlook all of that. 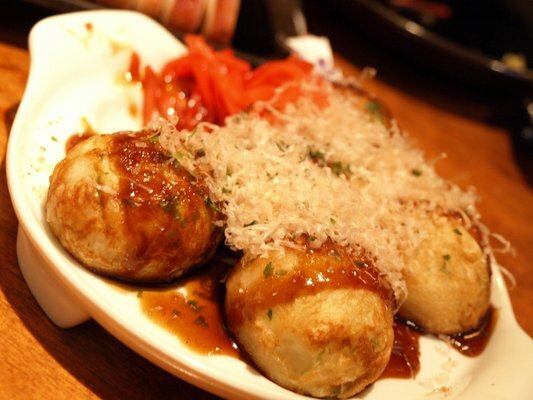 What I usually like to start with is their yakitori set, grilled yellow tail collar and tako yaki. Their ramen is really good too. 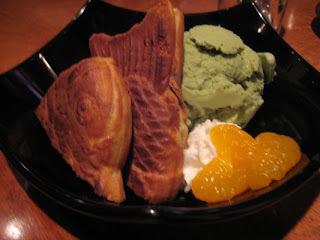 But I like to indulge on dessert and I almost always order the green tea ice cream with red bean filled cake. It is soooo good here. They make the red bean cake themselves so it's guaranteed to be fresh. This restaurant is worth checking out if you're willing to wait and put up with their service.